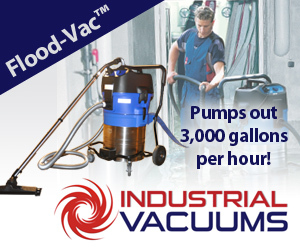 This powerful flood vac moves 3,000 gallons per hour and can be used as a vacuum, pump or both. 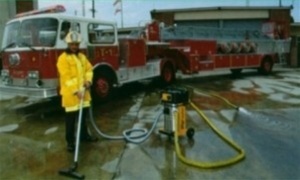 The HEPA vacuum picks up water and simultaneously discharges it through a 25 foot hose. The Attix 19 is one of the best vacuums for water damage cleanup available. 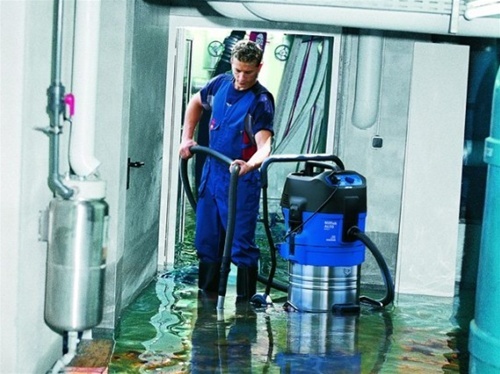 The Nilfisk Alto Attix 19 makes Salvage Easy. Reduces on-scene time. You never have to stop to dump this vacuum. To receive more info on this vacuum, please CLICK HERE. Used by Fire Departments in: FDNY, Washington, DC, Phoenix AZ, Los Angeles, Arlington VA, and many others. Used by the fire department after Sept 11 to clean up thousands of gallons of water from Pentagon attack. Designed for industrial and fire service use. If you have questions about any vacuum, we're glad to answer them at 1-800-214-9111. 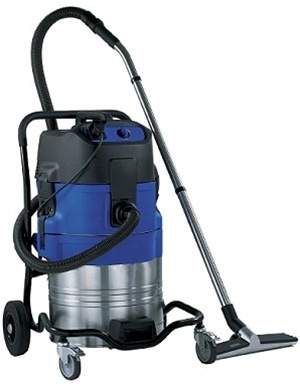 Its powerful vacuum has a 105 inch water lift -- the power of a carpet extractor. Now if you arrive on the scene and a sprinkler has put out the fire, you can remove the water and quickly return to service. Used by fire departments, industry, cleaning services, contractors, and hotels. The Water Relocator is a very solidly built wet vacs that can move up to 3,000 gallons per hour. The vacuum is rated to move 50 gallons per minute. The discharge sump pump built inside the vac moves 60 per minute. This means that the unit never has to be shut down. It constantly picks up water and discharges it so you never have to stop your operations. Most fire department users say that a 3 hour water pickup job with conventional wet vacs can be done in 30 minutes with the Water Relocator. The vac can also function on "pickup only" mode, and when you're done, roll it outside and flip a switch and it will self-dump. 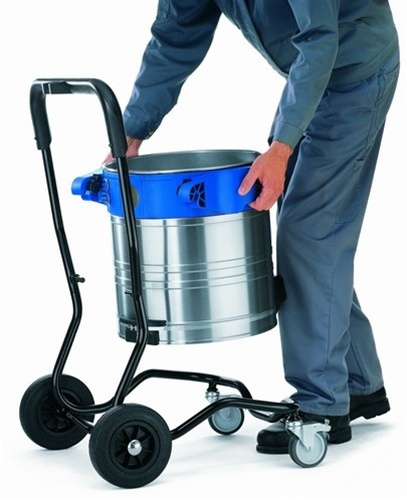 This has enormous value over a conventional vac which requires you to physically lift the unit to dump it, often creating sore backs in the long run for the users. Powerful Suction - The Power of an Extractor. The Water Relocator features a 105 inch water lift, which is nearly unparalleled among other vacuums. This means the it has enough power to lift water up a column of 105 inches above ground level. Inside the vac is a strainer that catches any debris over 5cm in size. 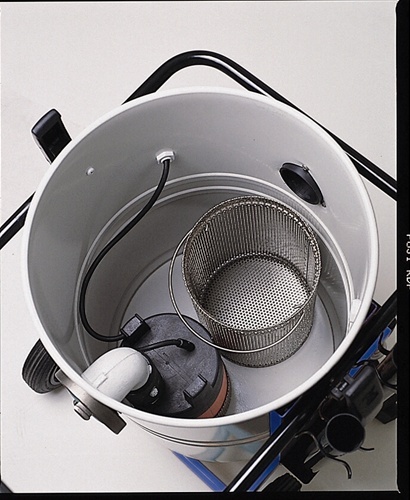 The strainer can be easily dumped by removing the lid of the vac and pulling the strainer out. The good thing about this is that you can operate around dirty areas after fires and not be worried about picking up debris and having it jam the system. 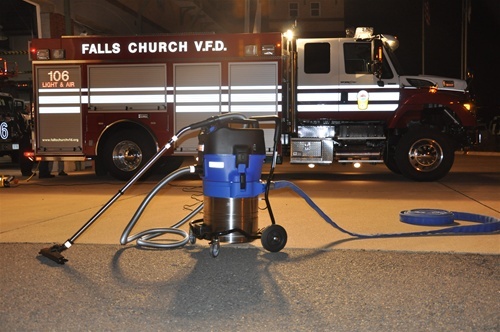 Fire department users report no problem using this vacuum around the heavy debris after a fire. The Water Relocator generates only 57db of noise. You can literally talk next to it without yelling. This is unparalleled among vacuums of its power. The vac is "smart" in that it has a built in pressure sensor that will automatically stop any water pickup if you are picking up faster than you discharge. For example, if your discharge hose gets kinked and you couldn't discharge as quickly as you picked up, the vac would stop the pickup for as long as it takes to dump water out of it. Then, once sufficient water was discharged, it would automatically start to suction again. Since the Water Relocator has automatic dumping of water at the flip of a switch, users never have to physically pick up the vac to dump it. This helps to prevent back injuries since water is very heavy. Many fire departments face the dilemma of needing to return to service for other emergency calls, yet also needing to stay on the scene of a broken water pipe or activated sprinkler for hours to perform water pickup after an incident. The Water Relocator is a lifesaver and timesaver! What used to take hours with a conventional wet vac or backpack vac now can be done in a much shorter time. 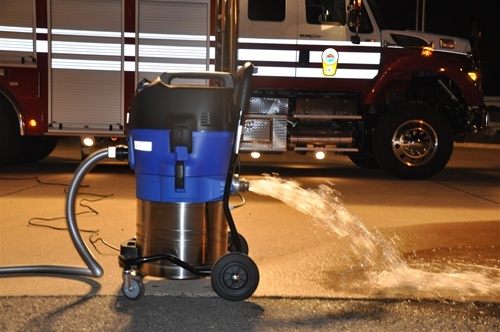 Many departments report a typical 3 hour water removal call using conventional wet vacs can be completed in 30 minutes with the Water Relocator. If you use a non-collapsible discharge hose, the unit can discharge up to 300 feet. Many fire department users connect an old section of 1-1/2 inch or 1-3/4 inch hose to the discharge port (a special coupler is provided for these users). Because the hose is collapsible and generates more friction loss, the discharge is limited to 100 feet. However, in most cases, users only need 25 feet of discharge hose to reach a drain. The sump pump inside the vac is powerful enough to pump the water up two levels (up to 23 feet vertically), for example, from a basement to the outside through a 50 foot section of fire hose. If you desire, the unit can work in a pickup only mode for up to 17 gallons of water. 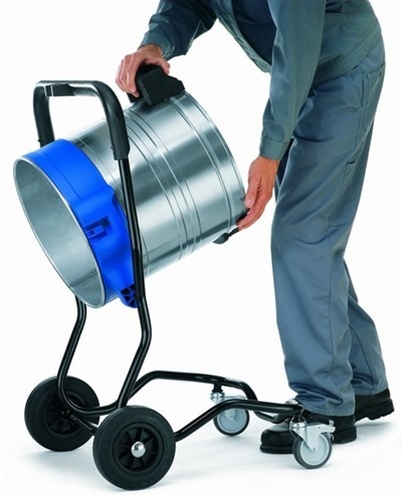 When the canister if full, simply wheel it outside or to a drain and flip the dump switch and the vac will dump itself. The Water Relocator is German engineered. Contractor, industry, and fire service users like its durability and power. The Water Relocator comes with a 2 year parts and labor warranty. The Water Relocator does not come with discharge hose, however, it does come with a 1.5" iron pipe thread or NST (National Standard Thread) connection for the discharge port so you can attach hose onto it easily. Discharge hose can be purchased in 25, 50 and 100 foot sections. Suction hose can be purchased to extend the length up to 40 feet total. See Parts and Accessories section under HOSES to purchase discharge hose. Our fire dept has used back pack wet vacs and standard Home Depot wet vacs for years to pick up water after fires or sprinkler activations. We recently got the Water Relocation vacuum and it is incredible... it moves water so fast and pulls water from carpets. The guys on my shift can believe how well it work and how much time it saves us with salvage. I would recommend it to any fire department. It is truly worth the money.